Oh, huh. I guess we did make them. They just didn't migrate into the books or PDFs, I guess. While no Jareth Urk seeks to be the commander of the Goblins on the fields of Valhalla. While Urk, lacks the Goblins King’s wicked hair and killer singing voice, he just might have a few tricks that can make him able to command the skittish Cutters as well as the merciless Skull Brutes. I went a slightly different way with determining Urk’s value. Cheerleaders are notoriously difficult to determine the point cost. Since Urk is unlikely to be drafted without Goblins squads, the question is, is he balanced when compared to those squads? Urk is priced right between them with good reason. With Mob Swarm, Urk and the Cutters cover less distance than the Cutters alone, but Urk with the Brutes can cover more than the Brutes alone. With a fully charged Mob Sneak Attack, statistically Urk is likely to put more wounds on high defense heroes than the Cutters but less than the Brutes attacking all together. All in all, his stats put him right between the two squads when covering ground and attacking heroes. Heroscape is a game of archetypes, and this is where Urk suffers. A tiny Goblin getting the Brutes to march in rank and file is a bit of a stretch. This is compounded during actual play when early movement with Mob swarm feels like a disciplined march rather than a mob rushing into battle. Normally the personality of a figure can tip you off how to play them, however during my games I found playing Urk boldly was a gamble. Theme wise he seemed much more like a tricky hobgoblin rather than a bold goblin, however he does look fairly furious with his duel blades. On the creativity side the combination of his mighty attack and the goblin movement bonus is very inventive. When activating Urk at the beginning of the game, I often found myself wishing I could move fewer goblins more spaces, since even the tiniest hills proved barriers to the goblin forces. Later on however the two moves made setting up Barge Into Battle a bit easier and were useful in the heat of the battle. While I knew that his Sneak Attack was mathematically ‘worse’ than a turn with the Cutters or the Brutes, the lure of that 6 attack (7 with height) on a specific target was enough to draw a few order markers. Man, is Urk ever complex to use to his potential. Even though I love Cutters and Brutes army, I am quick to admit it is one of the hardest combos to use in all of Heroscape only rivaling setting up a good Pelloth/Drow Lolth’s Wrath Special Attack or Raelin/Kiova/Imperium attack run. Timing the switch between Cutters and Brutes is almost as much luck as skill, and Urk only adds another variable to the equation. Once you shake off the cobwebs, Urk and the Goblin squads can be a fun and challenging army to play. I found Urk’s utility in getting the Cutters and the Brutes up the field in the first few turns, helping to set up Barge into Battle and Expendable Rabble for later. With some foresight of order makers, it was also possible to set up a strong Sneak Attack on a key figure (such as Spartacus or Cyprien). Surprisingly, I found if Urk survived to the end game he could do some clean up with the help of partial squads of Cutters and Brutes. I even kept a Brute alive by sacrificing a wounded Urk (I guess that Brute was not impressed with Urk’s commands). When building an all Goblin army or simply as part of a Goblin contingent Urk can find his place on the field of battle. While not a necessary draft, the flavor of a Goblin hero and the utility of a big attack allow Urk to find his niche in both strait up battles and scenario play. Bowie will always be the Goblin King, but Urk makes a fine commander in a pinch. I vote to induct Urk. @wriggz the Urk you linked to was rejected, I think. I submitted one by Superfrog and I here which I think is the correct one being reviewed. Good thing I played with the correct one. Nice custom, definitely a design that comes together on the battlefield. Bowie will always be the Goblin King, but Urk makes a fine commander in a pinch. Find the right mini for it, and I'll see what I can do. Trust not in the dark, for it is full of lies and deceit. Can Cormin be counted as a worthy addition to Heroscape or will the tricky rogue drag us down with his deceptions? Cormin offers 5 attack at a noticeable discount for only 75 points but that is measured against his lower life and paltry defense (not to mention his capacity to stab you in the back). His price as a lone melee hero seems a touch high if anything but the possibilities of Façade gives pause in this regard. With fragile stats and high impact, d20 dependent powers, Cormin is a swingy hero at the very least. Treacherous rogues are an established archetype with Stab in the Back fitting perfectly in that regard. The theme of Façade being an elaborate disguise that is revealed after the critical moment can be seen with the archetype as well, although the power strains credulity when Cormin uses it to trade with the same figure multiple times a turn. It feels like watching a Mission Impossible movie with masks on top of masks, although it is not enough of a problem to worry me. The power nevertheless cements his theme of a self-serving rogue as he throws his allies in front of devastating attacks to survive just a little bit longer. Stab in the Back is a perfect reuse of a power for the rogue and Façade stands as a unique and creative power that couples well with his attributes. While its theme may sometimes be a little tenuous, it opens up interesting and fun gameplay. Cormin can swing for quite a bit of damage with his attack of 5, but he swings even more in the value he provides in a particular game. Stab in the Back is the tip of the iceberg with this and is often best not to worry about given its low probability. The real swing factor lies in Façade and how long it can keep him alive before he relies on his 4 life and paltry 2 defense. It is Façade more than anything that informs his use. One might be tempted to try to use a fast and cheap high attack hero to assassinate a key figure in the early game but Cormin requires an established board position to switch with other figures or get cut down in the attempt. Saving him for clean up can be similarly dangerous as your forces may be too depleted for him to reliably switch with others, although he can function well if you have enough crippled squads remaining. He instead functions best in the midgame to have a wealth of Façade options, although even then he must be in an army that he would be worth using (and attacking). Façade on the surface trades Cormin with another, ideally one more suited to being attacked or at least less valuable should they perish. It is tempting to pair him with targets that want to be attacked such as Deathreavers or Samurai, but even this is only so useful. Many times your opponent is forced to attack them anyway so Cormin managing to switch with one is not so great a boon. If his attack of 5 is less valuable than another unit you could use, your opponent is even better off ignoring Cormin and focusing on those around him in the first place. When the conditions of your army and the opponent align such that Cormin is useful, he can be immensely satisfying to play. He is a challenge to use but having the occasional order marker to deliver a high attack can be just what you need to break through your opponent. Swapping into a sturdy defensive figure can overcome his shortcomings and sending your opponent to an early grave at the likes of Akumaken is a blast. At some points you must even decide whether to use the power at all or let Cormin defend himself for a change. Cormin the Dark provides a powerful attack at a noteworthy discount, but his role is far more niche than that suggests. When matched in the right armies and with a little bit of luck, the dastardly rogue is a pleasure to play and provides a unique and interesting power that is a welcome addition to Heroscape. I vote YES to accept Cormin the Dark into SoV. And here's our first inductee of 2016! Cormin the Dark by @Maklar the Silver Prince has received 4 Yea votes (Scytale, Soundwarp SG-1, superfrog, and Ixe) and has been inducted into the SoV! Next, Cormin will go through VC Editing and Art. Expect a card to be released soon. Edit: How fitting for the 5000th post in the thread. It's an honor to have Cormin the Dark be inducted into the SOV and to have a place in VC. I hope he'll be a blast for people to play. Congrats! Looking forward to playing him in online heroscape! Swaysil is a Centaur Archer from Pathfinder's Reign of Winter. The figure is double based. At 50 points, Swaysil is cheap. She offers some neat offensive tricks, and can possibly hit well above her weight with a timely (and lucky) Run Down and Point Blank Shot 1 combo. However, she is held back by an extremely low survivability with only 4 lives and 2 defense. This may seem not so bad, however, Swaysil likes to be in the enemy's face, well within counterattack range. Those 4 life points can go extremely quickly, especially since Swaysil often takes leaving engagement attacks. She is solid filler, as a cleanup figure mostly, although she can just as easily be used at other stages of the game. Compared to other ranged filler, she is good, but not on the level of Guilty or the Marro Warriors. With two simple powers, Swaysil is easy to understand. With Run Down and Point Blank Shot 1, she plays very boldly. 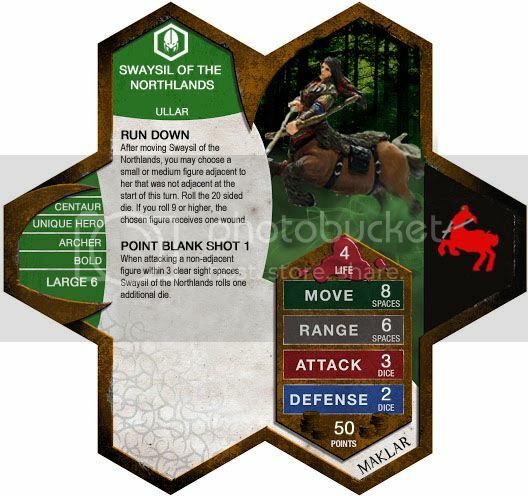 Although she can run and gun, if the enemy is fast, or the odds aren't looking great, Swaysil will charge into the melee to Run Down a squad figure, and then let loose an arrow at close range. However, if she fails her D20 roll for Run Down, she is a sitting duck. She will take damage most probably. The following turn you will often risk the leaving engagement strikes, even if they could possibly kill you, to just back up a space or two, or go after an unengaged figure to run him or her down. Swaysil is daring and willing to take damage, and leads to bunches of bold, unique, and fun play. Though her life, attack, and defense may seem low theme wise for a Centaur, the values are necessary for the design to work. The high movement is appropriate, as is the range of 6. Swaysil is double spaced. The figure looks great with other HeroScape figures. HeroScape has no Centaurs, which are half-horse half-men/women who appear frequently in mythology and fantasy. Swaysil offers a Centaur to HeroScape. She is fun to play, sporting an incredibly bold playstyle that I found incredibly fun to play. As a cleanup figure, you often risk the entire game when playing with Swaysil. She is a fun, offensive filler figure. Swaysil is a Feylundian Centaur, hailing from the harsh Northlands, a land dominated with ranging mountains, inhospitably climates, and dangers of all kinds. Faced with adversity for all of her life, Swaysil has learned that a moments hesitation can cost you your life, and so charges fearlessly into battle, using her momentum, body, hooves, or whatever she might find to bash in the skulls of enemies she catches. Let the enemy come. Those who are close by are only easier targets. The figure looks great. I got mine in a blind package in a gaming store a while ago, along with a few other Pathfinder figures, but I don't think that's the kind of accessibility you want to hear about. There are many on EBay. Most notably Kings of Light has 4 for $3.29. I believe they are a reputable source for minis. There is also a French website called Card and Cliz that has 14 in stock for 2,49 €. Obviously it would be impractical to purchase the mini and have it shipped to the U.S.
Paizo has the figure at $10.00, and lists 99+ of course. I'm not entirely sure how much this affects availability, but I'm going to guess not much. The figure is spread out across the internet. I only listed some of the bigger stores, but the figures are out there and available, even in Europe (at least France). The figure is on the expensive side, however, it is quite nice, in my personal opinion. It is solid and has some nice detail. Last edited by Maklar the Silver Prince; January 27th, 2016 at 08:36 AM.